The late Sean Edwards currently leads the Supercup standings after dominating large parts of the 2013 season. Often the final race meeting of the season has an end-of-term party feel to it. However, for the final rounds of the 2013 Porsche Mobil 1 Supercup, the tone will be decidedly muted, despite the spectacular lights of the Yas Marina circuit in Abu Dhabi. Sean Edwards currently leads the points standings, 18 points ahead of Nicki Thiim. However, the British star was killed at a track day in Australia two weeks ago, leaving his championship lead exposed. Despite a petition circulating around the internet, signed by a host of famous names from the motorsport fraternity, Porsche has yet to announce what will happen in Abu Dhabi. After a win last time out, Nicki Thiim is well placed to take his first Supercup title. The petition has been asking for the final two races to be run as non-points scoring affairs in order to preserve Edwards’ lead and make him the first posthumous champion in the series’ history. If the Abu Dhabi double-header is run to the usual rules, there are two drivers still in with a chance of overhauling Edwards at the top of the table. As the winner last time out at Monza (and current occupier of second place in the standings) Thiim is best placed to take the title, with the two races this weekend providing ample chance to wipe out the 18-point deficit to Edwards. Despite not winning a race this season, a strong result at Monza has kept Michael Ammermüller in the title hunt. German driver, Michael Ammermüller is a further six points back from Thiim. However, the second-year Supercup driver has yet to win a race and will need to break his duck this weekend if he is to stand a chance of taking the title. 2013 Porsche International Scholarship winner, Michael Christensen can draw level with Edwards with a double victory and, thanks to his win in Germany, would also match the Briton’s win tally. However, Edwards’ second place at Spa has ensured that the Dane cannot beat him in the final standings. 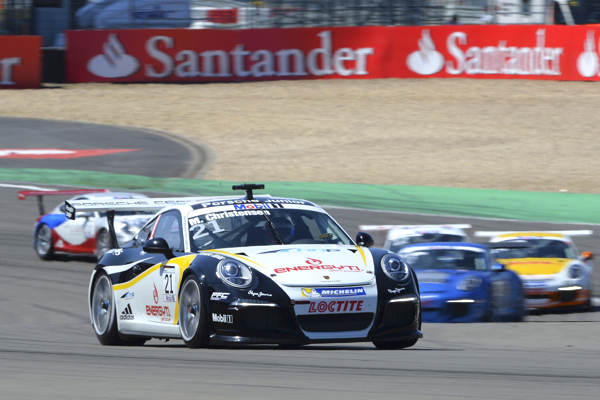 Michael Christensen has enjoyed a successful season as a Porsche Scholar, winning at the Nürburgring. Even if the drivers can score points in Abu Dhabi, there is nothing to stop the championship contenders from creating a gentlemen’s agreement, whereby they abstain from scoring enough points to take the title. One thing that is certain is the unpredictability presented by Abu Dhabi’s inclusion on the calendar. The circuit switches from fast, open sweeps with plenty of run-off, to tighter bends with the barriers in closer proximity. In some respects, it is quite similar to the Hungaroring circuit, where Edwards dominated proceedings. Without the late racer, lookout for Kuba Giermaziak and Christian Englehart, both of whom put in good performances in Hungary. The twists and turns of Abu Dhabi may suit Kuba Giermaziak, who performed well in Hungary. This is the Supercup’s first visit to the Yas Marina circuit, with it also being the first time that a Supercup race will be held in falling light. This ensures that all the teams and drivers will start from the same base come Friday practice. This should give Total 911’s ‘one to watch’, Ben Barker the chance to register his strongest result of the season. After a year learning the new Porsche 991 GT3 Cup, Barker will be looking to end 2013 on a high. With two races in which to achieve this, it would not be a surprise to see the Oxford-based racer better his sixth place from the German round in July. Ben Barker will be looking to round off the season with a strong result. Practice gets underway at 11:15am on Friday 1 November, with the qualifying sessions taking place at 6:55am on Saturday morning. Race one will start at 11:30am later that day, with the final, 22-lap race of the season beginning at 7:00am on Sunday 3 November. All times are in GMT.